I am a surgically trained prosthodontist. What does this mean? I received training in Prosthodontics at the Veterans Affairs Medical Center in Portland, OR. Prosthodontics is known to the lay person as advanced reconstructive and restorative dentistry. After this extensive training, I enhanced my skills by receiving full time training at New York University in all the surgical aspects of implant dentistry. No matter how complex or simple your dental condition may be, you can have a beautiful smile. Anyone who has had the poor luck of having “Bad teeth” and has had lots of dentistry their entire lives, knows how disheartening it can be to always be in a dental chair. No matter how hard they try, they always seem to get cavities and need more dental work. What Surgically trained prosthodontists can do is provide you with comprehensive care that stops the dental roller coaster and gives you a confident long lasting smile. 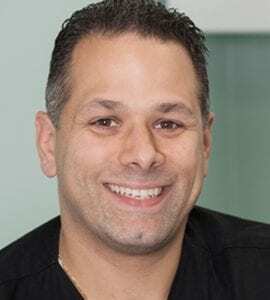 I often get asked on a second or third consultation, “Why should I choose you for my dental care?” I always tell these patients, as a surgically trained prosthodontist, I can provide unmatched treatment along with proper coordination of that that treatment, therby reducing your treatment time and keeping the process as comfortable as possible.